On the bridge where Russian political activist Boris Nemtsov was killed a small shrine to his memory has sprung up.Putin and his political followers would like it removed because it is a reminder that Russia is not a free country but one where political violence rules. Over three years we spend time with one of the care takers who prevents the shrine from being destroyed. 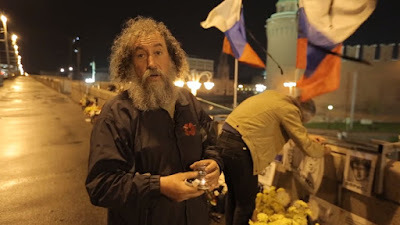 Solid and sober short doc is wake up call that how bad Russia really is. It is a stark warning of what can happen when a demagogue takes control of a country and becomes a tyrant. While not the be all and end all portrait of the situation in Russia is a wonderful look in through a window at the country our Preisdent colluded with. For more information and tickets to the remaining Brooklyn Film Festival screening go here.